Diggers Valley: 13 October 2012. The week beginning the 13th of October 2012. 568 was in labour and must have delivered her calf quite quickly. I checked her at 11.15am and she was still in the early stages, without any membranes or fluids appearing; at 11.55 I found her with her calf! 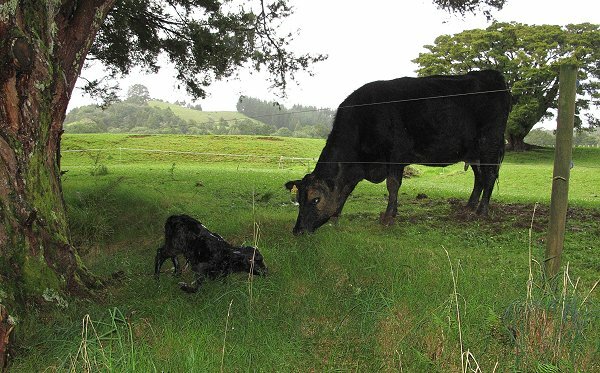 She gave birth to this one in the same spot she had the twins two years ago and behaved similarly, pushing the calf under the fence and down the slight slope. I had to go and push it back up to her several times. 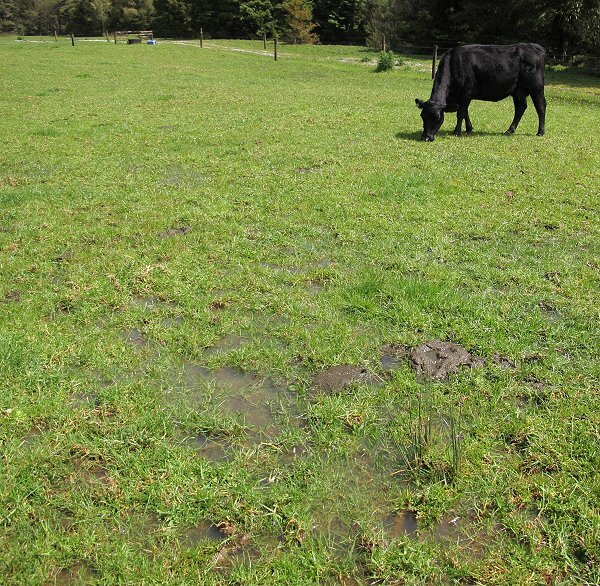 More rain, more water lying around in the paddocks. When will it end? Stephan and I walked out across the flats to go and effect a cow/calf-mob move, but seeing one of the cows bellowing at the riverbank, had to fix this problem first. 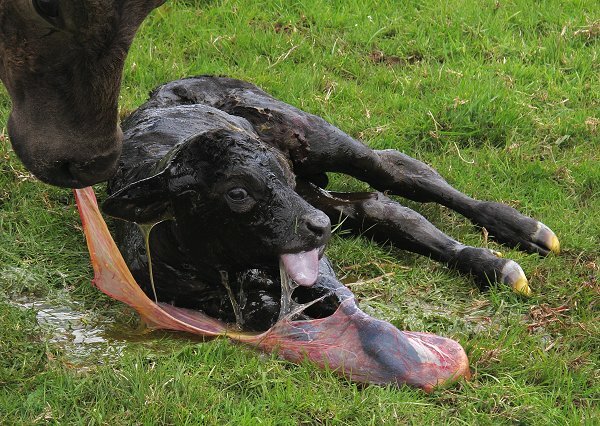 456's day-old calf had presumably gone through the fence to snuggle down in the long grass, but had then fallen down the bank (a drop of several feet) to the edge of the stream. He was very frightened, so continually tried to escape our valiant attempts to rescue him. 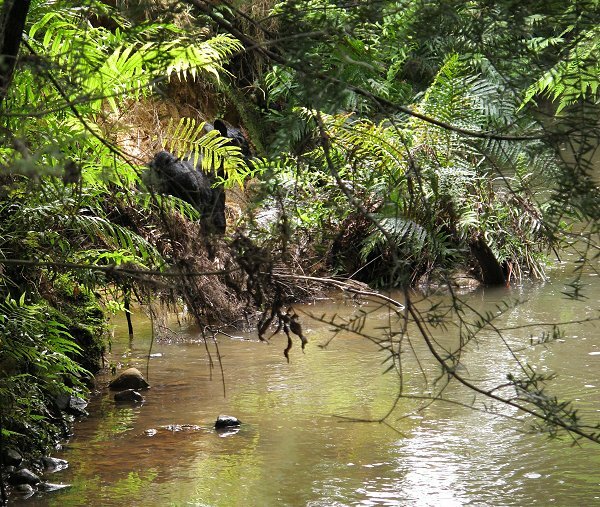 Eventually we both got into the stream and caught him, pushing him up onto a lesser slope, so he could return to his mother. 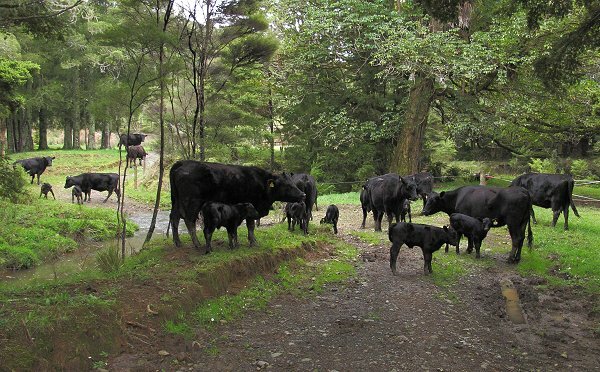 Fourteen cows and their calves, on their way from Mushroom 2 to the Back Barn Paddock. Teaching calves to negotiate lanes, gateways, mud and streams is one of the early jobs after calving. The more quietly we do these moves now when they're very young, the easier it is to deal with them later on. After we'd successfully moved that lot, we went out to fetch the five pairs in the Bush Flat paddock. I noticed that 579 had a very hard-looking back left quarter and, worrying that she might be harbouring a festering mastitis problem, I milked a little from that teat. The milk was pink and lumpy; quite disgusting looking. I milked out as much as I could, but when I moved to her other side because access was a bit easier because of where she had moved in relation to a tree, she gave me such a solid kick to my shin that Stephan, hearing it, thought she'd caught the tree with her foot. It was excruciating and I told her exactly what I thought about her lack of cooperation and something along the lines of, you can die in a ditch then, for all I care. I decided to leave those cows where they were for the night, so I could check on 579's general health again the next day. I didn't want to shift them out into a big paddock and then have to bring her back in if she'd started looking ill.
488 looked like she was in labour last night, but there was no calf this morning. At 10.30 she lay down, but after an hour of getting up and down, she'd produced no membranes, no bits of calf, so I brought her in to the yards. 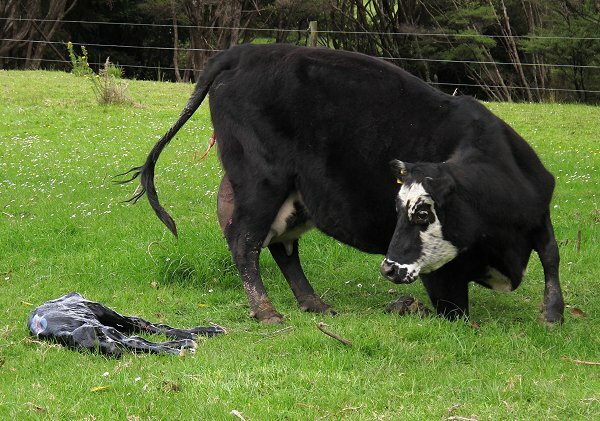 The calf was there, but still down in her belly for some reason, not up in her pelvis where it presumably should have been. 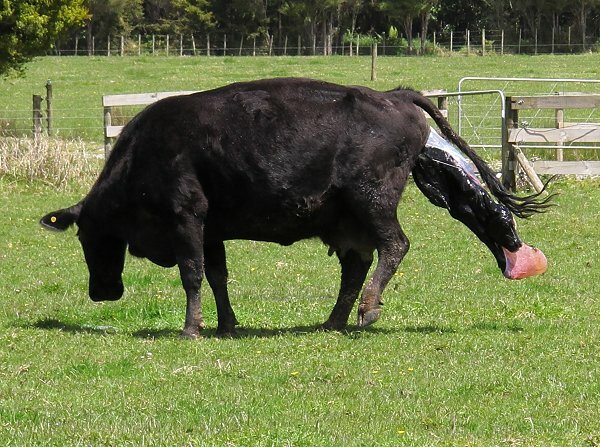 I pulled its legs up, made sure the head was there in the right place, and let her back out to lay down in the grassy loading-race area, where she soon produced a live bull calf. When more than one cow in a season has this sort of problem, I wonder what's going on. The fact that these sorts of things have happened two years in a row makes me very suspicious. Maybe they're just ordinary happenings, but I don't feel very confident about that. 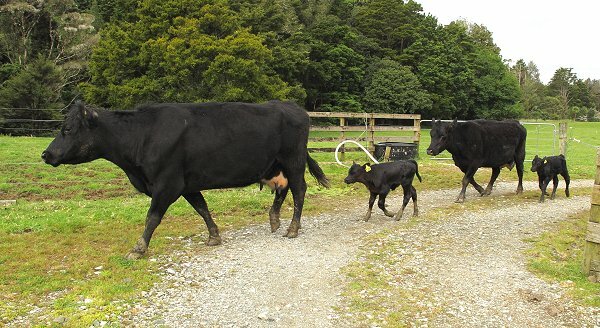 Mature cows should just get on with having their calves without anyone needing to intervene in the process. 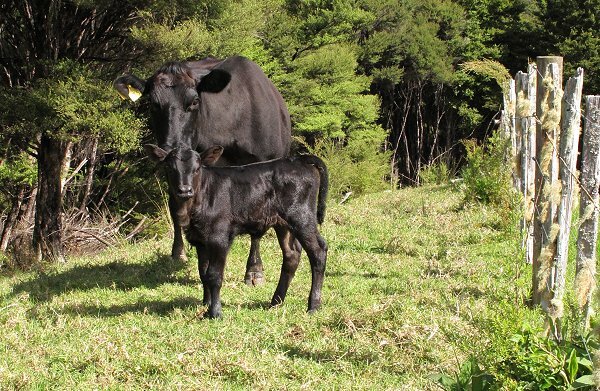 Out in the House Paddock, young 639 was doing exactly that, quickly and efficiently producing a grey bull calf. His tongue wasn't quite right though. I've seen this once before. In that case and this, it soon resolved and the calf fed successfully. 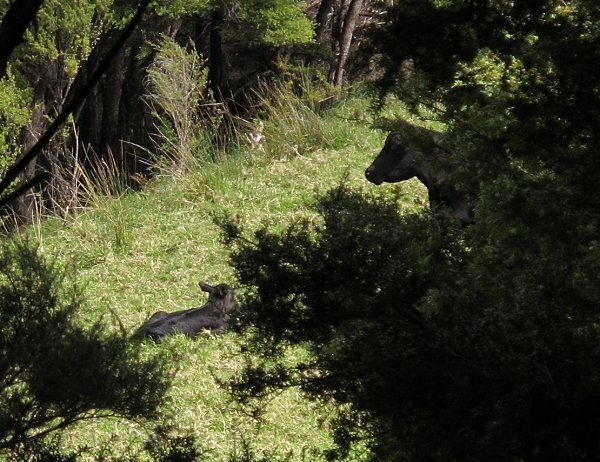 Having seen only four of the six cows in the Camp paddock as I'd passed, I went hunting for the other two. 546 was quietly grazing at the bottom of the hill, but it took me some time to find 475, at the top of the hill, sitting quietly with her new daughter. By the look of her, she was probably born yesterday. 579, with her horrible milk, was still looking quite well and her calf was able to feed without 579 protesting because her udder hurt, so I took the five pairs out to join the other 14 in the Back Barn. 579 walked quite comfortably, although still somewhat awkwardly, around her very large udder. 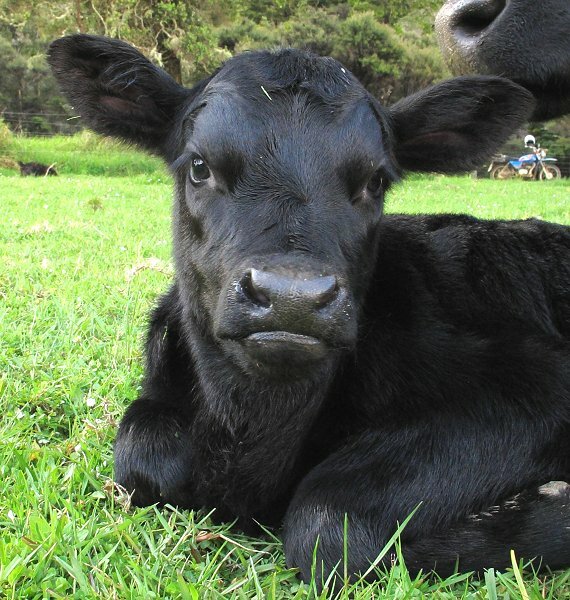 Pain on walking or when the calf feeds, would indicate a problem I should quickly do something about. I will continue to check on her daily. This is the orchid (now several) I watched flower last year, after we brought the bit of Puriri back from the Back Barn Paddock. There are now five plants with flower spikes growing. They're pretty colours already! These bits of Puriri are tremendously productive of orchids. They must provide an especially good environment for the fungus upon which the minute, air-borne orchid seed depends for germination and growth. To the left of the main group of plants here are two more same-sized leaves, but they have not produced flower spikes. There are more small plants growing in adjacent grooves in the wood. 475 was down at the Camp Paddock gateway with the other cows this afternoon. Her calf was not with her, so when she headed back over the stream, I followed her back to the top of the hill, where I eventually saw the calf. I coaxed the two of them down the hill and out of the paddock, onto the flats. Before I went up to find 475's calf, I'd watched 613 having her calf, so went back out to see if she was up and feeding yet, and found 548 had produced a calf as well. They're coming thick and fast. 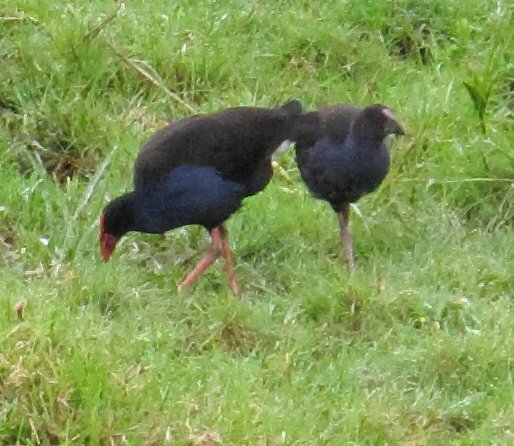 I can't ever get close enough to the Pukeko chicks to get a really good picture, but this one shows an indication of the beginnings of the adult colour on the young bird's shield. Their wing feathers have not yet grown fully, but they're changing very quickly. 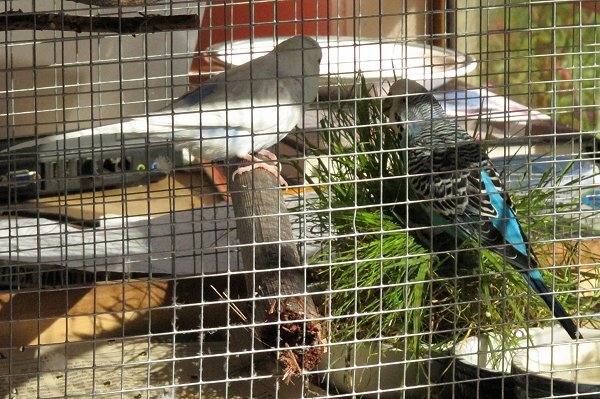 When Echo the budgie first arrived, he took no notice of any green things I put in his cage. Citronella seemed similarly uninterested. A couple of months ago I provided them with a container of rye grass I grew especially for them and after a while they began to eat it - or rather they sort of nibbled and chewed it, so the ends of all the grass blades looked ragged. Lately I've taken to digging circular clods out of the lawn and putting that in the cage and the birds really like it. When they've eaten all they're going to from one lot, I put it back out into the hole in the lawn and dig another bit up for them. 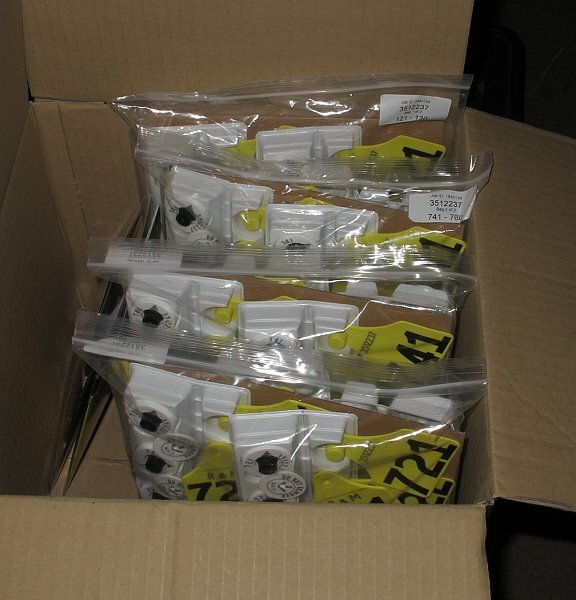 This box arrived with the mail last night and I didn't dare open it until today: the new ear tags for the calves. Fortunately they are exactly as I intended and have arrived in almost perfect time. We're putting the numbered tags in now and will add the NAIT tags a little later. 470 produced a black-faced daughter while I watched early this afternoon. Meanwhile back in Flat 1, 546 had been in labour and also produced a daughter. Surprisingly this wild swing around didn't throw the calf out onto the ground! We took more calves and cows to the yards for weighing and tagging. I'm gradually bringing them from the separate areas they've calved in, to new shared paddocks. Eventually I'll have two mobs with about half the herd each. 613's daughter, born yesterday. Her dad is Joe 90. 579's horrible-milk back quarter was half emptied this evening and her calf looked none the worse for the experience. 539's calf 689, who had the bloody poo last week, looks absolutely fine. 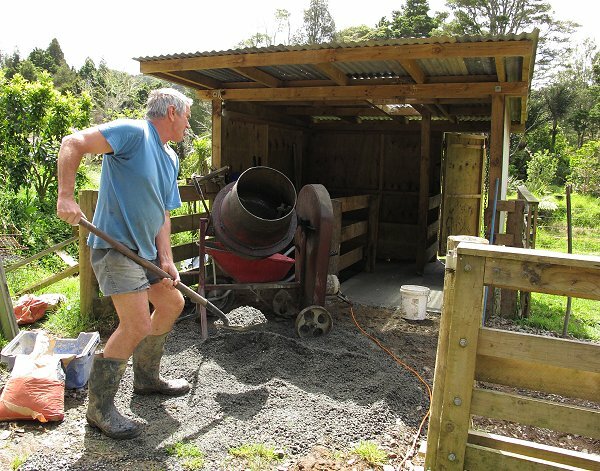 Stephan, feeling the urgency of the approach of Zella's calving date, has been working towards concreting the floor of the little milking shed. When Mike and his boys were here last week, he got them to help him dig out the soil which needed to be removed for the boxing to go in and the concrete to be laid, and today he started pouring. 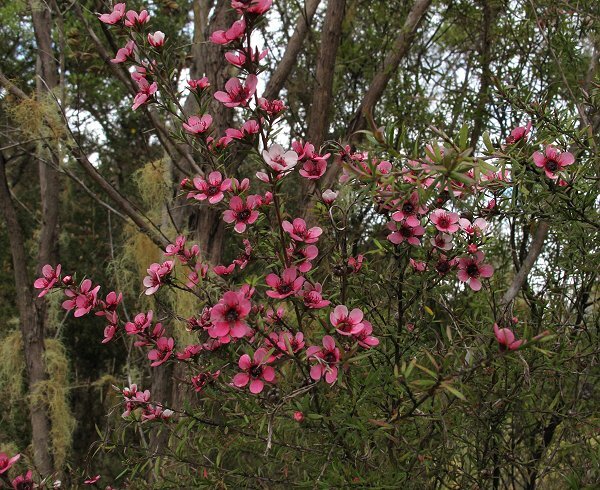 Last year I discovered this beautiful Manuka tree in our Swamp Paddock wetland reserve and collected a number of seed capsules. I have no idea what happened to them, so today I collected some more. This time I'll plant them as soon as they come out of the capsules. There was some strident bellowing coming from over the road and having not checked on the heifers for a couple of days, we went up the hill for a walk. 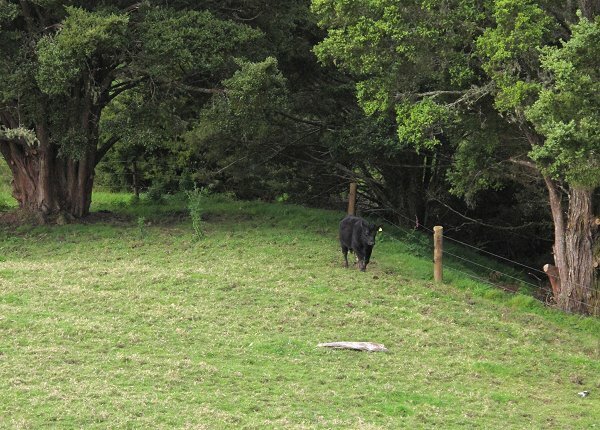 We found most of them on the west-facing slopes, but Ivy 112 was not with them, because she was pacing around the fencelines in the horribly agitated state of bovine oestrus expression. I bet she'll be glad when she doesn't have to endlessly repeat this three-weekly cycle. Presumably all the yearling heifers will be big enough to get in calf this summer and from then on, they'll only experience one or two heats each year, before they're back in calf each time. 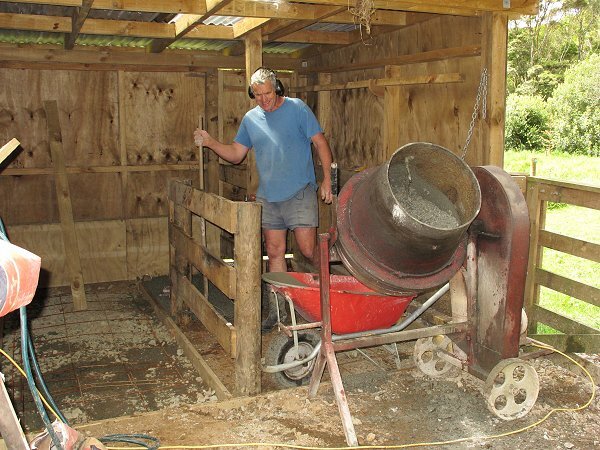 Today, concreting the other side of the inner part of the shed, where the calf will spend some of its time. We'll have to work out what to put down on top of the concrete for the calf to sleep on, since concrete is far too cold and hard. But we need a surface it is possible to clean easily. These two things are typically found at this time of the year, because cows leak! 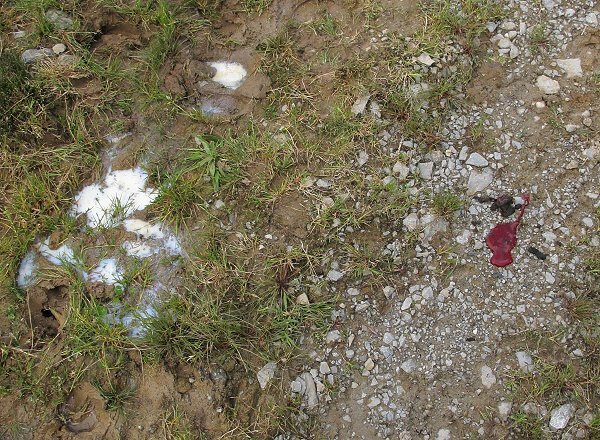 There's bloody lochial discharge (the uterus continuing to clean out after the birth of the calf) and leaked milk. 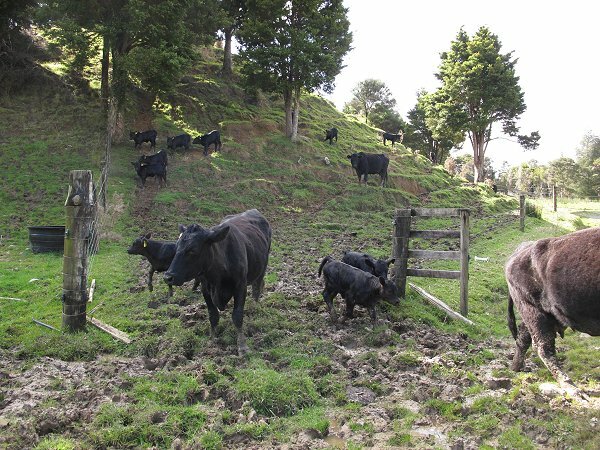 Calves on this farm have to learn early about boggy, muddy areas and how to get through them. There needs to be a culvert here so these two gateways (to the Pines on the left and the PW on the right), don't get so messy. I let the cows and calves out of the PW and straight around into the Pines. There have been no calves since Tuesday. We now have 21 heifers and 12 bulls: 33 of the expected 38 calves.